I get emails all the time from women and men asking questions about specific types of birth. Some want to know how to have a safe home birth, others the best possible hospital birth. Some women know they’re having c-sections and want more info on what that involves. I get questions about different types of midwives, waterbirths, pain management techniques and what all those medical interventions are about. People want answers about IVs, fetal heart monitoring, tests, treatments and how to sop up amniotic fluid. They want to know how to evaluate the safety standards of doctors, birthing clinics, and midwives. I’ve even had a few readers ask if I’d be their nurse when they go into labor so they know they’re getting good care. In short, women and men want more information at their fingertips so they can plan for the safest, most empowered and personal birth possible. While I can’t go into the delivery room with you, I can supply answers to all your questions in one place. My friend and former fitpregnancy.com editor, Dana Rousmaniere and I co-wrote a book with Amanda French, MD OB-GYN of Brigham and Women’s Hospital and Susan Thomforde, CNM from the North Shore Birth Center in Massachusetts. Our book, The Complete Illustrated Birthing Companion (Fair Winds Press) is now available for purchase. While there are dozens of pregnancy books on the shelves already and a few books that cover specific types of births, we wanted to do something different. We wanted to provide a step-by-step guide for how to approach any type of birth you want, from home birth, hospital birth, C-section and intensive care. We wanted to present the whole enchilada so women and men could make the best decisions for their healthcare, no matter how they plan to deliver. You know my style – I’m all about telling it like it is so I wrote lots of sections called, The Real Deal and Inside Information. For example, in Chapter One there’s a Real Deal section that covers the myth of the Perfect Birth. Some patients come into labor with a list of specific requests. “I’ll have a light epidural. I don’t want to feel any pain, but make sure I can still move my legs.” Getting an epidural is significantly more difficult than making a latte. You can’t really order off the menu. The type of epidural you receive depends on many factors: what stage of labor you’re in, your anesthetist’s training and technique, your anatomy and response to medications, how long you might need your epidural, whether you might need to have a C-section, and even how busy things are on the labor unit. Want to know what the IV and blood work is all about in the hospital? Want to know how to write a smokin’ hot (yet realistic) birth plan? Read the book. It’s in there. 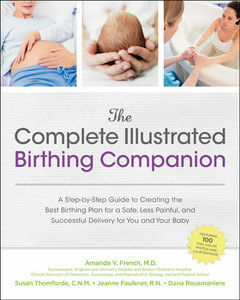 The Complete Illustrated Birthing Companion was released this week and we’re pretty excited about it. There’s information tailored for first time and experienced parents, younger parents and older ones and lots of information specifically for fathers. Thanks for inspiring the book, readers. It’s because of the questions you ask us that doctors and midwives like Amanda and Susan, and writers like Dana and I decided to create what we like to think of as the better birthing bible.